On the morning of June 10, Kristen Jacobs was monitoring the Twitterverse for mentions of her employer, Creative Memories, as she usually does. One tweet in particular stood out. Upon closer inspection of the tweet and link, Jacobs discovered that Creative Memories was going head-to-head with one of America’s biggest retailers, Target, in a “Minnesota Brand Madness” challenge put on by the Minneapolis St. Paul Business Journal. Creative Memories learned first on Twitter that it was included in the Minnesota Brand Madness competition. This was news to Jacobs (the company’s web content community manager), as well as the rest of the scrapbooking company. But Jacobs knew where to turn first. Creative Memories turned to Facebook first to get out the vote. What happened next is a testament to the importance of a loyal fan base. 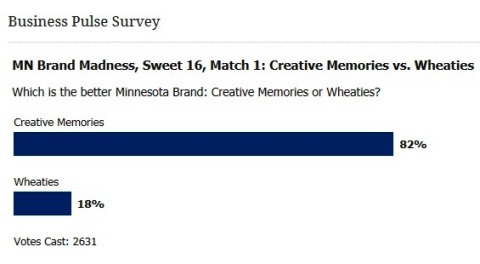 Creative Memories fans didn’t just respond, they voted for the company again and again, through six rounds of the brand competition, against much more well-known names such as Wheaties, Mall of America, Dairy Queen and Mayo Clinic. In the end, Creative Memories emerged as Minnesota’s Best Brand. The lesson: It’s not the quantity of fans that matters but the quality. Much smaller Creative Memories (60,000 fans) beat Target (4.7 million fans) by 81 percent. 75,000 total votes were cast in a matchup against Mayo Clinic. Creative Memories beat 64 companies to be named Minnesota’s Best Brand. If you haven’t heard of Creative Memories, then you’re probably not into scrapbooking. The St. Cloud, Minnesota–based company, started in 1987, sells scrapbooking supplies and services through more than 40,000 home-based consultants around the world. The company’s Minnesota headquarters employs 500 people. Creative Memories helps people preserve memories in attractive scrapbooks and enables their independent consultants to make money. Until recently, Creative Memories took a casual approach to social media, with a marketing person posting only occasionally on the Facebook and Twitter accounts in addition to her other job responsibilities. This past March, Jacobs joined the company with a primary focus on building the social media network. 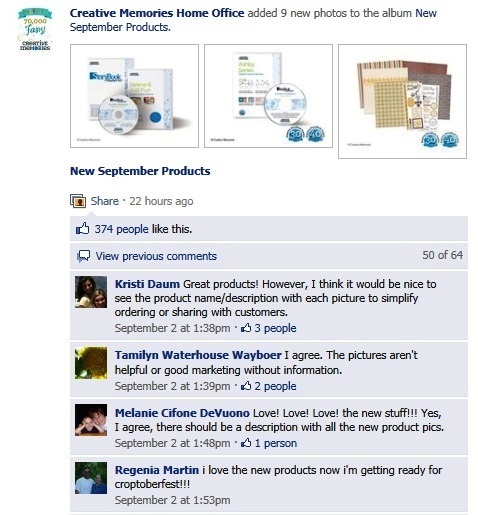 Creative Memories uses Facebook to share news about new offerings and get feedback from the customer base. 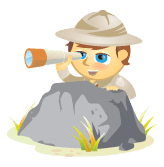 Jacobs posts engaging content about products and offers, tracks responses and answers questions on the wall. The number of “likes” and comments gives the company unprecedented insight into customer preferences, as do Facebook surveys about potential new products. That insight then shapes actual product offerings. Surveys help Creative Memories shape product offerings. Not only does the fan page help build relationships among the home office and customers and consultants, it also serves as a community for all fans. Fans answer each other’s questions, making the site a valuable source of information and education. Jacobs is tasked with not just engaging Creative Memories fans and followers, but also with providing content that independent consultants can share on their own Facebook pages. To date, about 40 percent of their consultants have Facebook fan pages. Just a few months after Jacobs took over as the company’s social media voice, the Minnesota Brand Madness competition put Creative Memories’ social network to the test. 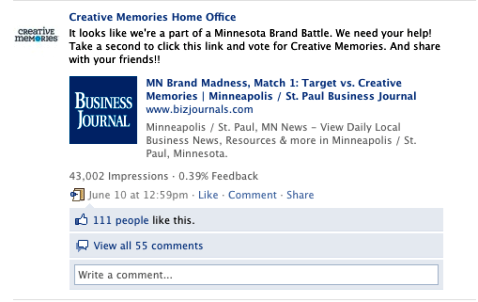 To win, Creative Memories had to go up against a different Minnesota brand for six consecutive weeks this past summer. In total, 64 brands competed before Creative Memories was crowned Minnesota's Best Brand. And all were arguably recognizable national and international brands based in Minnesota, with millions of fans and followers. First was Target, with its 4.7 million Facebook fans to Creative Memories’ 60,000. After Jacobs’ fast post about the Target face-off, the fans came through with votes and enthusiastic comments. In the end, more than 4500 votes were cast and Creative Memories beat Target with an impressive 81 percent of the vote, which Jacobs attributes to her get-out-the-vote post. Notably, Target didn’t tap its Facebook network to help with voting. “Target could have killed us if they would have even tweeted about it one time. There’s no doubt about it,” Jacobs said. From that first round, Jacobs also turned to key partners for their support in getting the word out. Provo Craft & Novelty, maker of the Cricut machine for scrapbooking, tweeted and posted to its fan base of 30,000. Nancy O’Dell, a celebrity spokesperson for Creative Memories, also tweeted each time to her 142,000 followers about the competition. Celebrity spokesperson Nancy O'Dell helped get the word out. Specifically, Creative Memories called on its partners for extra posting when competitors would start surging, such as Arctic Cat for round two. 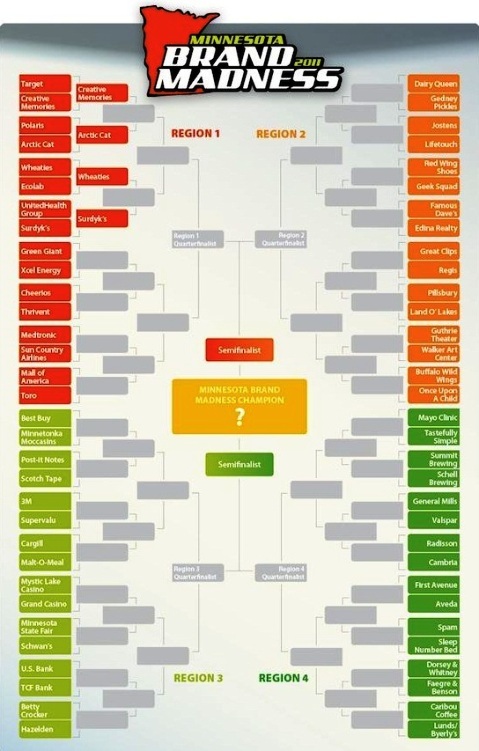 In round three, Wheaties was the easiest win, Jacobs feels, because the company also didn’t engage in social media to spread the word. Wheaties didn't engage in social media to spread the word. The competition toughened in round four with Mall of America. “We knew that one would be more challenging, and it was,” Jacobs said. Again, the company benefited from posts by Provo Craft, Nancy O’Dell and also charity partner Make-A-Wish Foundation. This time, Creative Memories edged out the mall with 63 percent of the vote. Creative Memories beat the popular Mall of America with 63 percent of the votes. Next came not just a Minnesota favorite but a national one, Dairy Queen, proving it’s not easy to beat ice cream. In the final moments of the competition, Dairy Queen started surging unexpectedly, picking up thousands of votes after leading all day. While out shopping with her family, Jacobs saw the spike and took action—a testament to the immediacy of social media. From 64 companies, in the end it came down to Creative Memories and the prestigious Mayo Clinic—the toughest competition yet. A total of 75,000 votes were cast before voting ended. Again, Jacobs called in the fans, followers and partners who had stuck by the company from the beginning. “It’s just amazing that we were able to just keep people going for that long and not drive them nuts after six weeks, and that they were still so excited to support us,” she said. 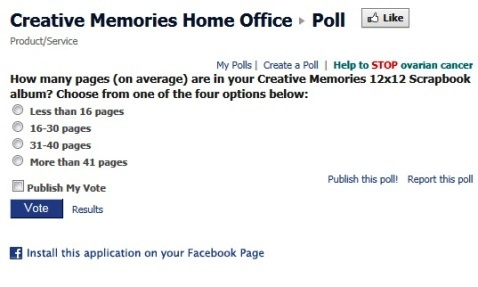 Interestingly, the Mayo–Creative Memories matchup drew hundreds of comments on Facebook and the voting page, and even sparked debate. What’s more valuable, saving lives or scrapbooking? But Creative Memories fans didn’t see it that way. After six weeks, Creative Memories won Minnesota’s Best Brand against Mayo with 59 percent of the vote. Creative Memories won Minnesota's Best Brand. Jacobs and McClintick are certain that Facebook made the difference, especially considering that approximately 89 percent of consultants are on the social network. “There’s absolutely no doubt. If we didn’t have Facebook, there’s no way that we could have gotten this far,” Jacobs said. But those fans and partners had to be in place first. “They were ready to go, ready to respond when we asked a question or posted something. So, ours is not a static site at all. There’s a high level of engagement,” Jacobs added. Creative Memories learned about the Brand Madness competition by listening, in this case monitoring Twitter mentions on HootSuite. Otherwise, the company may not have known about the competition and mobilized its fans to vote against Target. It’s not the size of the fan base that matters most but the size of the fight in the fan base. Active, passionate fans made the win possible. Be consistent and dedicated to build your audience. The engaged audience and loyal partners were in place before the competition began—and hence ready to move when asked. What do you think? What are you doing to build the quality of your fan base, not just adding numbers? Leave your comments in the box below.